Get Up To Speed (GUTS), the careers fair aimed at getting young people into engineering, manufacturing or technology, is taking place at Magna tomorrow. The annual event returns to Magna Science Adventure Centre in Rotherham for the third time this year and is designed for young people, their families and teachers to see some of the UK's best innovations first hand, hear from and talk to those involved in their success and learn about the future of the sector and its evolution through technology. Attracting big names like Rolls Royce, Sheffield Forgemasters, and Tata Speciality Steel, Get Up To Speed is the biggest event of its kind in Yorkshire. Around 50 engineering professional bodies, colleges, training providers and companies will be exhibiting at the fair and exhibitors include Chesterfield Special Cylinders, Naylor Industries, Polypipe, Yamazaki Mazak UK Ltd and Tinsley Bridge. Sponsors include Santander, Sheffield Tooling, AESSEAL, the Institution of Engineering and Technology and the Institution of Mechanical Engineers. Organised by Sheffield-based charity the work-wise Foundation, in collaboration with local partners including RIDO, CQ Strategic Marketing and The Manufacturing Forum, the event at Magna Science Adventure Centre in Rotherham is expected to attract at least 2,000 young people. As well as exhibitors there will be attractions including an Army Husky vehicle, an F1 simulator, a 10m Scalextric, demonstrations of 3D printing and the chance to try virtual reality welding. 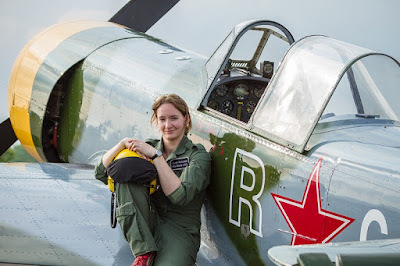 Stunt pilot Lauren Richardson (pictured) will also be in attendance, and University of Sheffield students will be bringing an 18m human-powered glider. Get Up to Speed is free to schools and families. It was first run in 2011, moving to Magna, which is set in the former Templeborough steelworks, in 2015. John Barber, of the work-wise Foundation, said: "Get up to Speed is a chance to see some of the UK's most exciting engineering inventions, and meet the people who design, build and operate them. "It really is a great place for the engineers of the future to be inspired and for companies to be part of that future. "And Magna is the perfect venue for this event. The building is steeped in industrial history. As a giant former steelworks it is awe-inspiring and I can’t think of a better place to host an event that is all about encouraging young people to think about a career in manufacturing, engineering or technology." John Silker, chief executive of Magna, added: "We are delighted to welcome the event back again. We are very much part of the local business community and we are all about science and education. And Magna is a cathedral to industry – both in the past and the future."